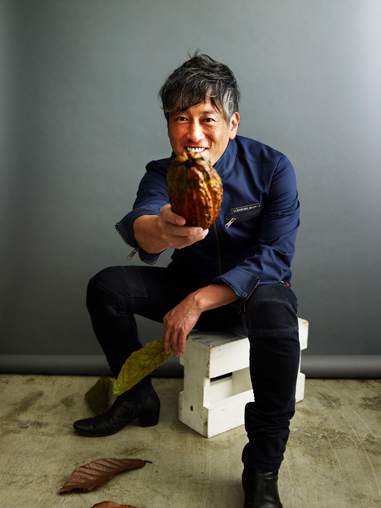 Chef Koyama is pleased to announce his latest series of chocolate creations for 2016, “Susumu Koyama’s Chocology 2016,” at Salon du Chocolat 2016, the world’s largest chocolate event, to be held in Paris, France starting on October 28 (Fri.), 2016. Fermentation and maturation, both essential to the process of making chocolate from cacao berries, have also been key elements of Japan’s culinary culture since ancient times. With combinations of present-day technology with the gifts of nature, arising from our ancestors’ wisdom and techniques, Koyama has create four new varieties of chocolate imbued with the force of nature. These will be unveiled at the Salon du Chocolat Paris, where eS Koyama debuted in 2011 and has been exhibiting each of the past six years. The creations of Koyama, who was born and trained in Japan, and Japanese craftsmanship in general are the subject of much attention in Paris, and this will serve as an excellent opportunity to convey Japanese culture to the world. Also, at the request of the Salon du Chocolat organizers, once again this year Chef Koyama will present a demonstration (October 30, 11:00) and seminar (October 31, 14:00) at the same venue, on the theme of “unprecedented flavors from Japan,” featuring chocolate confectionery made with fermented and matured ingredients. He will also conduct a seminar presenting the heavenly marriage of chocolate with Tokushima yuzu, a specialty citrus fruit from Tokushima Prefecture. Salon du Chocolat attendees should not miss these events as well! 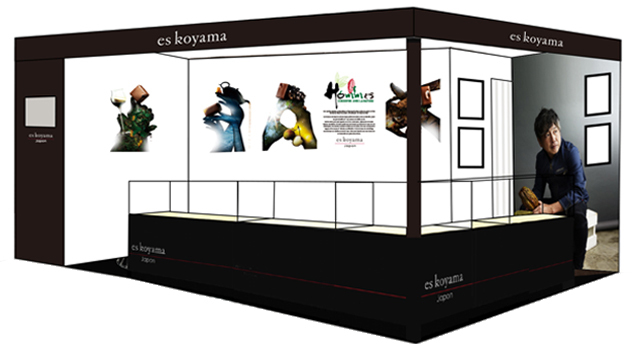 Below is an artist’s rendering of the eS Koyama booth, which countless chocolatiers visit each year. This year’s four chocolate submissions to the C.C.C. (Club des Croqueurs de Chocolat) competition are each marked with an original “Human” logo, and the booth as a whole has a stylish and elegant look. On the left, facing the booth from the front, will be a wall-mounted monitor showing an original video related to the four chocolate varieties. Our artisanal chocolate-making expresses nature (and the flavors she created), and is built on the wisdom and skills our ancestors handed down to us. “Expressing nature” means accepting nature as it is and giving an honest and heartfelt voice to what we feel about the different things Mother Nature creates. I have come to believe strongly that this is a universal theme in craftsmanship.  Since he first participated in the contest held by France’s most authoritative club for chocolate devotees, C.C.C., in 2011, Koyama was awarded the first prize for five years in a row. 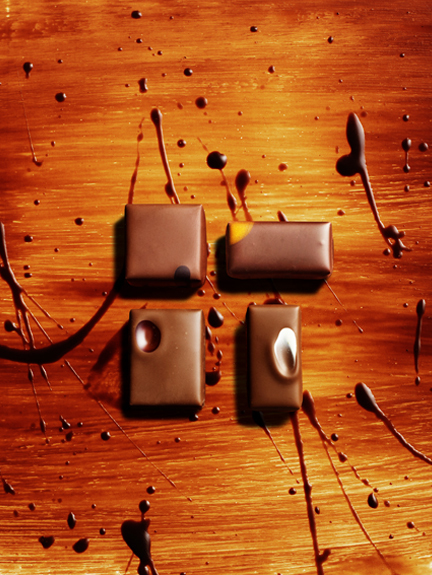 He has also won numerous prizes for four consecutive years, since 2013, at the International Chocolate Awards. His ever-expanding activities as a global chocolatier were recognized in the 2016 International Chocolate Awards Americas and Asia Pacific Competition with eight gold, 21 silver, and three bronze awards. Each year Koyama visits cocoa-producing countries, thus far traveling to Ecuador (twice), Madagascar, Vietnam, Indonesia, Columbia (twice) and Peru. He continues aiming to be not only a chocolatier but also a “cacaotier,” meaning he gets as close as possible to the mentality of people in cacao-producing regions, spending his days learning about the history of these regions, the cultivation environment, and the potential of cacao itself, from cacao hunters and chocolate couverture artisans.